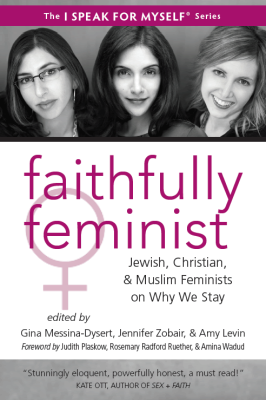 "I am proud to announce my latest book co-edited with the brilliant Jennifer Zobair and Amy Levin - it is the 6th volume in the I Speak For Myself series being released this summer, titled "Faithfully Feminist: Jewish, Christian, & Muslim Feminists on Why We Stay". The book is a collection of essays by 15 Christian women, 15 Muslim women, and 15 Jewish women, all of whom self-identify as feminists and as women of faith." "Feminists argue that you cannot be a “true” feminist if you are a practicing Christian, Muslim, or Jew. Likewise, religious practitioners claim that you cannot be a “true” Christian, Muslim, or Jew if you support feminist values. Nevertheless, women who practice these religious traditions and hold feminist values are not uncommon, and the question “Why do you stay?” is one that is frequently asked of them." "Their stories are told with wit, insight, and above all, honesty. I have learned much from these women and I hope that each of you will as well. This book will spur much dialogue and I cannot wait to see how it unfolds."